Intimus degaussers rely on APT (Advanced Pulse TechnologyTM). During the erase an effective quick burst generates a strong and powerful pulse. This results in 90% lower energy consumption compared to other models. At the same time they produce an erasing field many times stronger than those produced by the read/write heads in hard drives and tape drives. The field strength of an intimus degausser destroys the magnetic structure and ensures that the data are no longer recoverable by computer or laboratory attacks. Since the technology does not rely on software, it will also completely and permanently erase failed and damaged hard drives regardless of the operating system or interface. Built-in safeguards check the stored power before each erase cycle, ensuring complete erasure every time. A field strength meter, audible tones and lighted push buttons report the status of the degausser to the user. NATO listed and NSM certified. 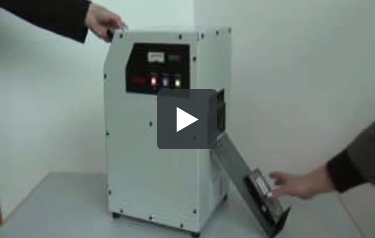 Clean and quiet solution to sanitize magnetic media. Fast Slide Feeding Solution for single HDDs or batch mode. Shielded, no magnetic influence on surroundings. Internal Verification of Magnetic Field. Intimus Crypto Degausser 9000. Load hard disk drive and start degaussing process. Batch mode. Overload detection. Fast, safe and complete erasure in only one go. Audio and visual verification of degauss. Continuous duty, no cooling cycles necessary. Very low magnetic influence to surrounding. Intimus Crypto Degausser 9000. Does this unit shred and Degausse? No this is just a degausser that can be added onto your hard drive shredder for added security. Using the two units together will allow you to magnetically erase the data from your drives before shredding thus adding additional security and preventing any chance that sensitive data can be extracted from discarded or obsolete hard drives.